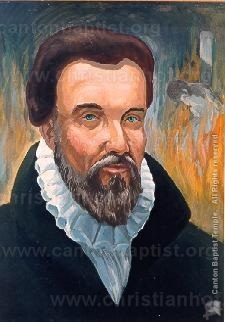 Bible translator and reformer, Tyndale was ordained as a priest in 1521, having studied Greek diligently at Oxford and Cambridge universities Following his studies he joined Sir John Walsh’s household, with duties not easy to define. Some accounts describe him as a tutor to Sir John’s children; some make him chaplain to the household; while another suggests he acted as secretary to Sir John. One day Tyndale was engaged in a discussion with a learned man who told him it was better to be without God’s law than that of the Pope. To this Tyndale retorted that he defied the Pope and all his laws, adding that if God were to spare his life, before many years passed he would cause a boy who drove the plough to know more of the Scriptures than this learned man. Tyndale had found his vocation: translation of the Bible into English. Tyndale conferred with Luther in Germany and stayed on the continent translating the Bible from Greek into English. The printing of the translation was begun at Cologne in 1525, but was stopped by an injunction obtained by Johann Dobeneck, a vain and conceited man who hated the Reformation and opposed it in every possible way. Tyndale fled to Worms, where the book was printed. Copies were smuggled into England, where Archbishop Warham and Bishop Tonstall ordered them seized and burned. Tyndale’s influence upon English literature was great, chiefly through the use made of his renderings in the King James Version of the Bible (1611). It is estimated that 60 percent of this translation is derived from that of Tyndale.